Impurities, such as Fe, Ni and Cr, can adversely affect the performance of a CIGS solar cell. It is therefore important to understand how impurity concentrations may vary from surface location to location. The Fe contamination for CIGS on steel substrate is a common problem. SIMS is often used to determine Fe concentrations and uniformity at different locations (X Y). 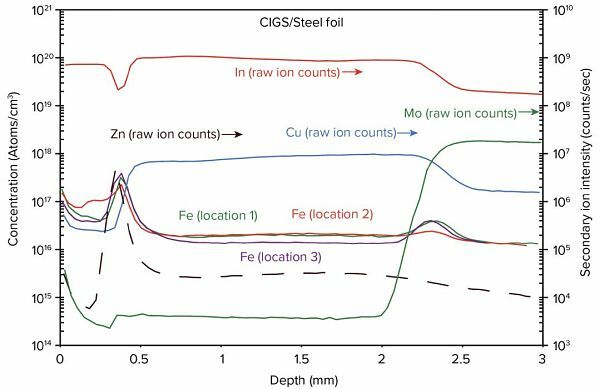 The lateral distribution of Fe in CIGS/steel substrate is often observed to be non-uniform. Fe data collected using typical SIMS analytical conditions can therefore be misleading due to non-representative sampling. A better SIMS sampling approach is needed to address this issue. A primary beam of oxygen ions (O2+) is used in SIMS analysis of Fe in CIGS. The spot size of a focus primary beam is ~ 15 to 20 μm. The primary beam is rastered over a square area, typically 200-250 μm in width. Secondary ions (Fe+) generated from the center portion of the rastered area are collected. In a SIMS instruments, secondary ions can be detected using either EM, FC or Ion Image. 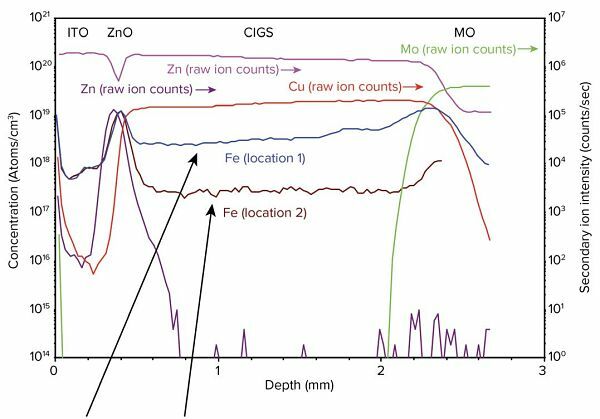 Under typical SIMS analysis conditions, with a data collection area of ~ 25 μm (in diameter), Fe concentrations often show large variation from location to location. Fe profiles taken from two locations that are 300 μm apart – the difference in Fe concentrations is ~ 10x! Secondary ion images of Fe in CIGS/Steel foil. Brighter spots represent higher Fe concentrations. 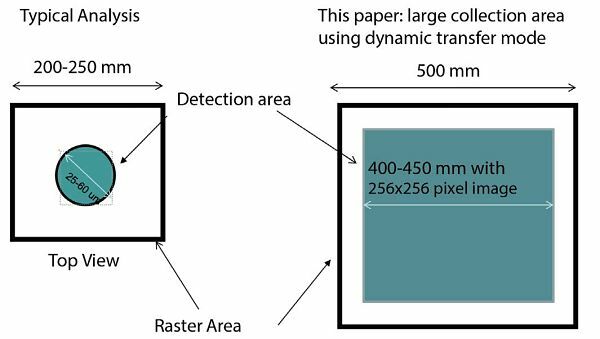 With a SIMS detection area of 25-60 μm, the Fe signal detected may not be representative of the average Fe concentration in the sample. SIMS image depth profiles show total Fe concentration from a 450 x 450 μm data collection area. Selected Area Depth Profile from area 1 and area 2 (50 x 50 μm) illustrate the reason for large Fe concentration variation often observed in regular SIMS profiles. The lateral distribution of Fe in CIGS/steel foil is often observed to be non-uniform. Regular SIMS profile analysis may therefore not provide representative sampling. The use of a large collection area is shown to reduce the location to location variation significantly, providing a more representative sampling of the average Fe concentration in the sample. Large area SIMS image depth profiles not only provides a large data collection area, but also ion images that show lateral distribution of impurities. Depth profiles can be re-constructed after analysis to provide variation of impurities at different locations.